If you’ve purchased an older home, you may be pleasantly surprised to find that there is a hardwood floor hidden beneath a layer or two of subfloor and linoleum or carpet. Once a standard flooring material, hardwoods went out of style when wall-to-wall carpeting became affordable for the average homeowner. The solution for many was to place a layer of plywood subfloor over the “old fashioned” hardwood in order to lay the latest style of carpet. Many new homeowners will find that by removing the subfloor, they will find a beautiful hardwood floor that has been hiding for decades. Remove the quarter-round molding from the perimeter of the room by gently prying it away from the wall, using a small pry bar to pull the quarter-round at the securing nails. If you plan to reuse the quarter round, number the pieces as you pull them so you know in which order they came off. Begin in a doorway of the room and slide the curved end of a large pry bar under the long edge of the subfloor, tapping with a hammer if necessary. Place a scrap of cardboard on the opposite side of the doorway to protect the floor in the next room from being marred by the pry bar. Pry the subfloor up, using a steady pressure to push the pry bar towards the doorway. The first row nails of the subfloor will pop loose. Move the pry bar two feet at a time along the wall and repeat the process, using the cardboard to protect the baseboard. This will loosen one quarter or more of the eight-foot length of the subfloor. 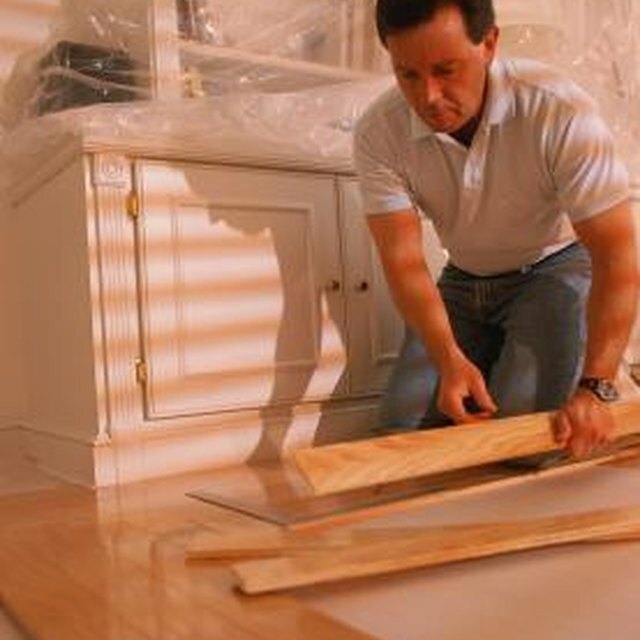 Return to your starting point and hook the large pry bar under the loosened subfloor. Pull straight up until you hear the next row of nails pop loose. Grasp the loosened edge of the subfloor with both hands, and facing into the room pull the subfloor up until it is waist high. Squat below the piece of subfloor and push up until the entire piece is free from the floor. Continue the process with any remaining sections of subfloor until it has been completely removed. Always wear heavy work gloves and eye protection.